This entry was posted in IT and tagged notizie on November 10, 2012 by FEMEN. This entry was posted in PL and tagged nowości on November 10, 2012 by FEMEN. 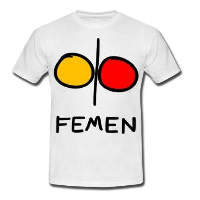 This entry was posted in EN and tagged news on November 8, 2012 by FEMEN. This entry was posted in SE and tagged nyheter on November 7, 2012 by FEMEN. This entry was posted in EN and tagged news on November 6, 2012 by FEMEN. This entry was posted in FR and tagged nouvelles on November 5, 2012 by FEMEN. This entry was posted in IT and tagged notizie on November 5, 2012 by FEMEN. O grupo ativista Femen, famoso em todo o mundo pelos protestos sem roupa, esteve no centro de Belo Horizonte na tarde desta sexta-feira (2). Três integrantes criticaram a violência contra mulheres da tribo Guarani-Kaiowá, do Mato Grosso do Sul. O protesto ocorreu na Praça da Estação, tradicional ponto do centro da capital mineira. Uma das manifestantes se revoltou com o estupro sofrido por uma indígena da tribo. — Ela foi largada lá como se fosse um bicho, até alguém chegar para socorrê-la. This entry was posted in PT and tagged notícia on November 2, 2012 by FEMEN.